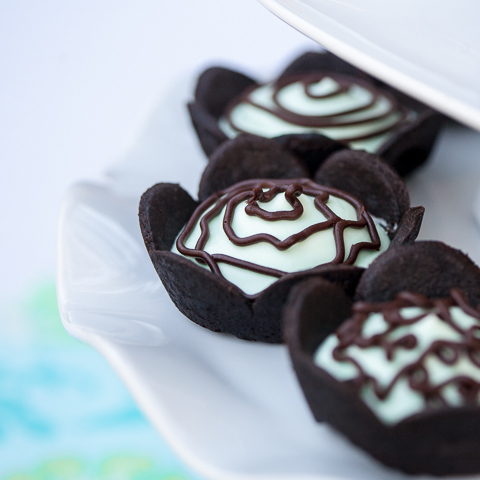 Pale green minty deliciousness billows up from inside little chocolate cookie crusts. 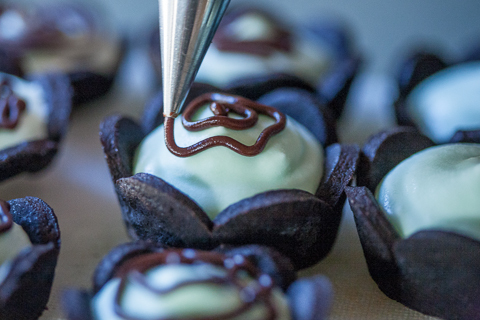 These cupcake-sized grasshopper tartlets make perfect finger food. We didn’t eat much junk food at my house growing up, but we did indulge in dessert most nights after dinner. Often, we finished our meal with a simple bowl of ice cream, but sometimes my my mom — a master of sweet, indulgent treats — served us something much more exciting. In late summer, we could persuade her to bake a blackberry pie nearly any day of the week. At other times of the year, I’d do what I could to convince her to make Grasshopper Pie. Not only did the cool, minty filling of this ’70s era-cocktail-inspired-dessert taste impossibly good, it always looked so pretty. That pale green deliciousness billowing up from inside the chocolate cookie crust made such an impression on me that I chose its calming hue as part of the color scheme for the first quilt my mom made for me. My mom still makes Grasshopper Pie when I visit, and it always brings back memories of family and friends around the dinner table. A few years ago, I asked her to share her recipe with me so I could make it for my own family and friends. With its crushed chocolate cookie crust and no-bake filling, I couldn’t believe how simple it was to prepare. 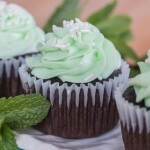 While I love the original recipe in all its glory, last week I felt inspired to create a diminutive version of this dessert for St. Patrick’s Day. 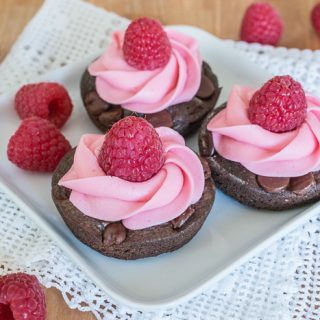 I’ve long wanted to make tiny tart shells from chocolate cookie dough, and this recipe gave me the chance to experiment with the idea. 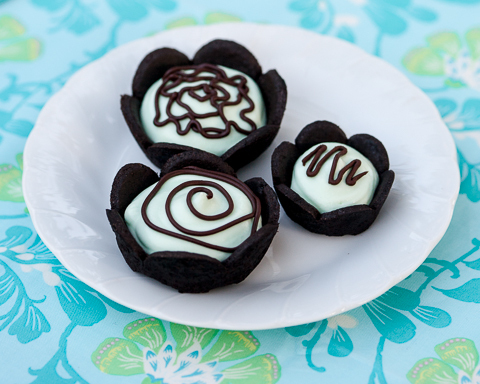 After rolling out the rich, chocolate dough, I cut flower-shaped cookies which I tucked gently inside muffin tins to bake. I wasn’t sure how this would work out, but when they came out of the oven, the little cups, all ready for some delicious filling, matched, nearly perfectly, the vision I’d imagined in my head. I say “nearly perfectly” because the dough puffed and buckled a bit during baking, especially around the bottom edge. Once filled, the crusts worked just fine, and their deep chocolate flavor tasted amazing with that fluffy mint filling. I knew they could be better, though, so tried baking them again. I learned that, after placing the flower-shaped cookie dough in the muffin pan, simply pricking around the bottom edge with a toothpick eliminated most of the puckering. When I piped that gorgeous, pale green filling into the prepared mini tart crusts, my family hung about the kitchen as they sometimes do when I’m baking. Most of the tarts went into the freezer to chill, but we couldn’t help sampling them right then and there. 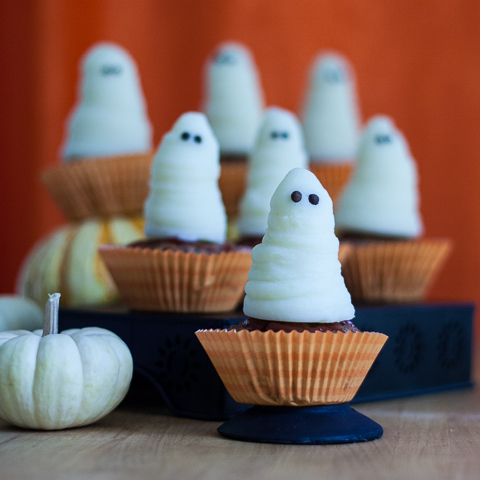 Since they’re the cupcake-sized, they feel like finger food, and we didn’t even consider using utensils. The girls each gobbled one down in no time, I had to fight them off from the freezer to prevent them from partaking in another round. Given my husband’s furtive movements during this diversion, I feel almost certain that he visited the freezer for seconds. 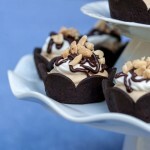 Once the tarts had frozen, my husband suggested piping a bit of chocolate onto the top as a finishing touch. Piping totally intimidates me, but I tried it anyway. I’m never one to argue with the idea of adding extra chocolate to a dessert, and I couldn’t really think of a better way to accomplish it. I have to admit, even with my mediocre-at-best piping skills, they turned out pretty well. While I didn’t go as crazy for St. Patrick’s Day as I did last year — when I made green bread and green pasta for my family — no one’s complaining. My kids much prefer it when my experiments involve sweet treats. Like I did when I was young, my daughters always make suggestions about what I should make for dessert. Given my emotional attachment to some of my mom’s desserts, I wonder, when my kids are all grown up, what they’ll remember as their favorites. Adapted from Ginny Cowden’s recipe. Makes 24 small tarts. 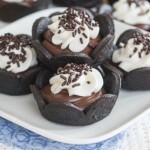 Combine flour, cocoa powder, and salt in a small bowl. Set aside. Combine butter and sugar in the bowl of a standing mixture on medium speed with the paddle attachment. Beat until light and fluffy. Add egg and vanilla extract and beat until well combined. Add flour mixture and mix on low speed until the dough comes together, about 1 minute. Turn the dough out onto a lightly floured surface and knead 2 or 3 times. Flatten into 2 disks, wrap in plastic, and chill until firm, about 30 minutes. One at a time, roll out the chilled disks of dough to about 1/8-inch thickness on a counter generously dusted with cocoa powder. 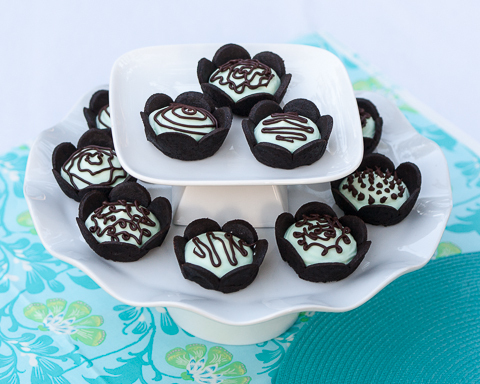 Using a 3 3/4-to 4-inch flower-shaped cookie cutter, stamp out as many flowers as possible. 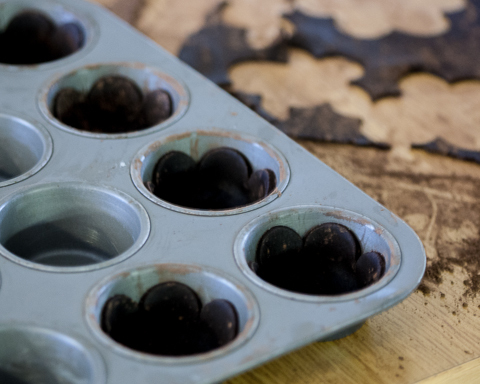 Gently transfer the dough to a greased muffin tin, tucking each flower gently into one of the cups. With a toothpick or sharp skewer, prick holes in the dough around the edge of the cup, about 1/8 to 1/4 inch apart, adding a few holes in the center as well. Gather the scraps, re roll, and stamp out additional cookies to fill the remaining cups. Bake in an oven preheated to 350° F for about 10 minutes, until just set, shifting the baking sheets halfway through for even baking. Let the cookies cool in the muffin tins for 5-10 minutes before running a thin metal spatula around the outside edge of each cup. Leave cups in the pan to cool completely before removing carefully. For the filling, combine milk and marshmallows in the top of a double boiler. Heat and stir over gently simmering water until marshmallows are melted. Remove from heat to cool, stirring every 5 minutes or so. Combine liqueurs and add to the marshmallows, blending well. Whip cream until stiff peaks form. Fold marshmallow mixture into the whipped cream until well combined. Transfer the mixture to a large pastry bag and pipe into prepared tart crusts (if the mixture seems to runny at first, chill for 5 to 10 minutes in the refrigerator before adding it to the pastry bag). Freeze prepared tarts until firm, several hours to overnight. For the ganache, place chocolate chips in a small bowl. Heat heavy cream in a small saucepan until it just begins to boil. Pour heated cream over the chocolate chips. Let it sit without stirring for 2 minutes, and then whisk vigorously until smooth. Let cool slightly before transferring it to a small pastry bag. 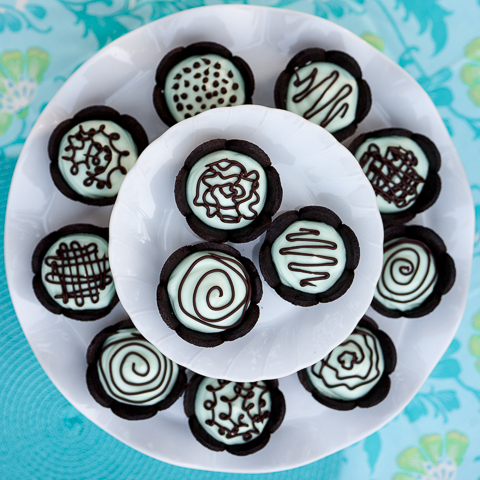 Pipe ganache decoratively on frozen tarts before serving. 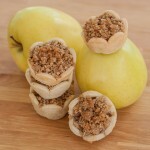 Yum, your tarts sound great and they look gorgeous! Wow! 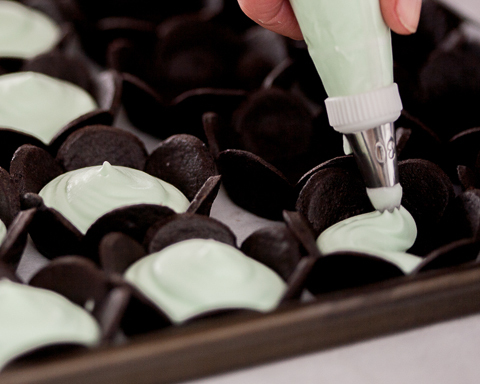 I have been eating thin mints, but those look way better! 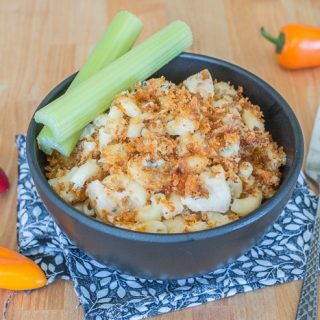 Any chance you will be trying this recipe again in June? You totally busted me! And now that our daughters read your blog, they know my secrets for sneaking an extra dessert.